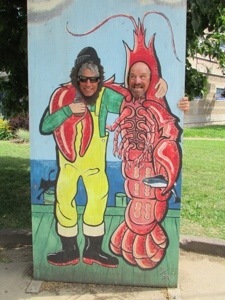 So, we had a good time in Pictou, Nova Scotia. It is a very pretty town and we were able to meet up with our friends Sharon and Jim who are travelling to the Caribbean on their sailboat. They left Kenosha, Wisconsin (near Chicago) in mid June and they expect to be gone for two years. 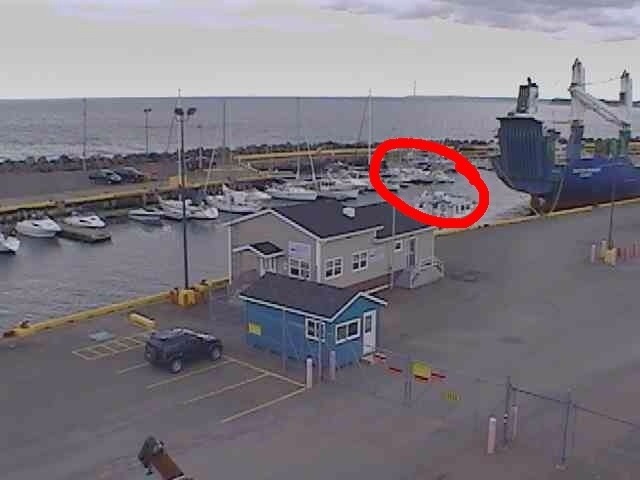 They are travelling with three cats and while they were in Summerside, one of the cats went missing and it took three hours of scouring the marina (many people helped look, including Guy LaFleur, who was on his boat!). Finally, Sharon went back to the boat as she was very upset and could hear the cat meowing. I guess one of the cupboard doors was left open and the cat climbed in and then kept going down further and further into the boat. Anyway, it all worked out but I am sure it must have been a very unpleasant experience to lose your cat in a strange place. Here are a couple of pictures – the first one is of Jim and Sharon and the second one is of Dennis and Jim – they are quite the pair! While we were in Pictou, we had a bit of a disaster at the marina. We were sleeping and suddenly could hear a polite but insistent knock on our boat. It was Jim and he had unplugged the power from our boat as well as his because one of the electrical panels on one dock over had started on fire! The firetrucks arrived and doused it but it could have burned down the whole marina – yikes! I guess Sharon heard all sorts of snapping and crackling and told Jim to unplug the boat from the electrical panel (we had already had some trouble with it earlier) and then he saw the fire. The whole marina was shut down then – no power for anyone which was probably a good idea. 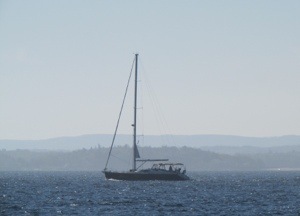 We had a good sail from Pictou to Souris – it was lots of fun! The wind actually went in the right direction for the entire day and varied between 15 and 20 (which is perfect for me) and we made good time, much faster than if we motored. It was a good way to end the summer. 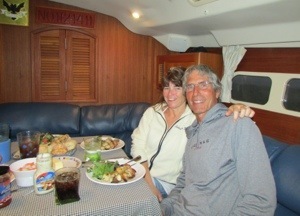 It would have been perfect had we seen a few dolphins and whales jumping by the bow of the boat, but it was not to be. I had to settle for a gigantic horsefly hitching a ride, some seagulls and a few gannets doing their dive bombings. On the crossing over from Pictou, I listened to an excellent podcast from CBC Ideas – The Mortal Sea. It is about the collapse of the fishing industry and if you have an extra hour, it is definitely worth listening to. Here is a little video we made – it features Dennis on the guitar. Once we arrived in Souris, we met up with a guy on a homemade boat from Duluth, Minnesota. He and he wife were going to the Caribbean. Here is a picture of the boat (the man made it himself). Check out the picture below – I have red circled us. I will be coming home on Wednesday – Eric, the marina manager, is lending us his "rig" so that Dennis can drive me to the Charlottetown Airport. 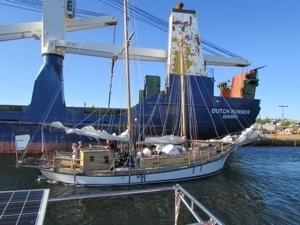 The boat is coming out of the water on Thursday (weather permitting) so hopefully Dennis will be home on Sunday.